Carvir is the exclusive USA master distributor for DeGang Machinery Co., a leading manufacturer of packaging equipment. 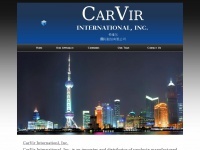 The web server with the IP-address 69.41.162.15 used by Carvirintl.us is owned by 1-800-HOSTING and is located in Dallas, USA. This web server runs a few other websites, mostly in the english language.